‘In Moscow I learned some good technical skills. 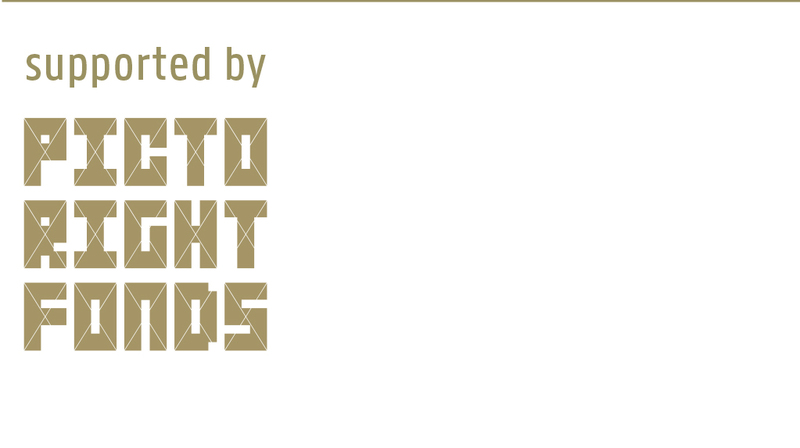 In Vienna I developed insights in functions and aesthetics. In Eindhoven I learned how to do research and ask myself questions about the ‘why’ of design.’ Daria Biryukova (1989) is happy with her broad education, and she is just as happy with Eindhoven as location for living and working. The Communication Teapot by Daria Biryukova made it into the New York Times in March 2017, as illustration of an article about ‘Five Places to go in Eindhoven’. Actually there is an interesting story behind that design. 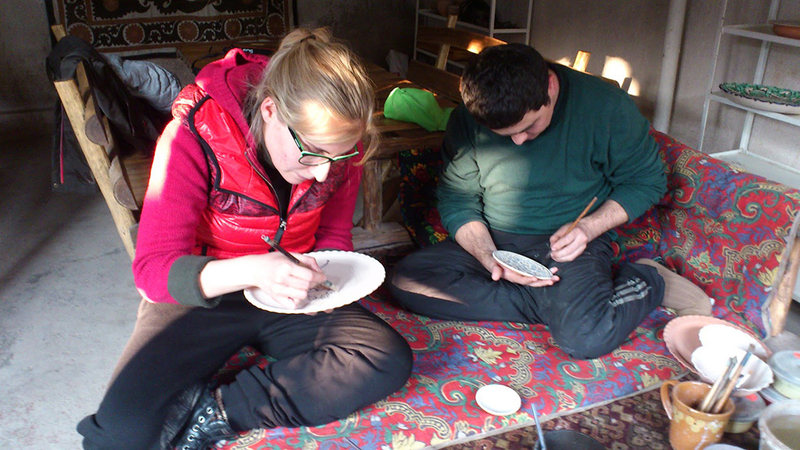 For her graduation project at the University of Applied Arts in Vienna Daria went to Uzbekistan to do research on local ceramic production. How would traditional craftsmanship from the East collaborate with contemporary design from the West, at what point would they intersect and where would they build on each other? How could eastern and western values be combined in a synthesis to create something excitingly new? 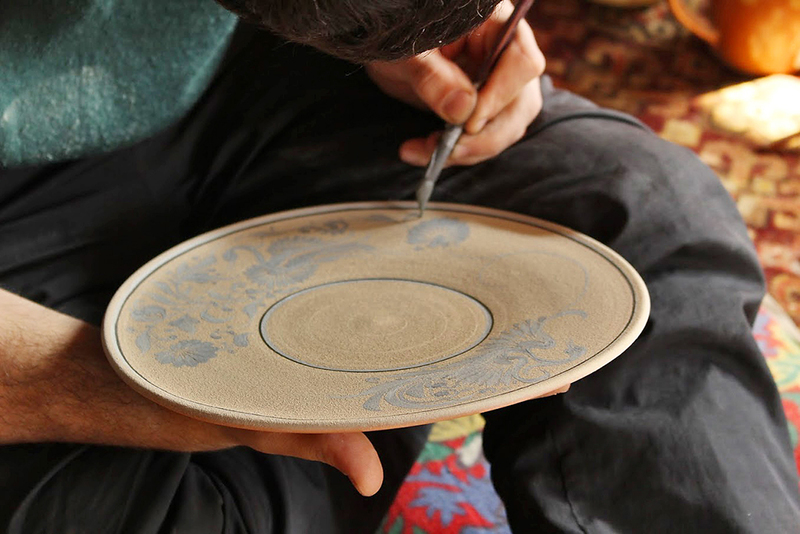 The tradition of ceramics from Uzbekistan goes back thousand years. 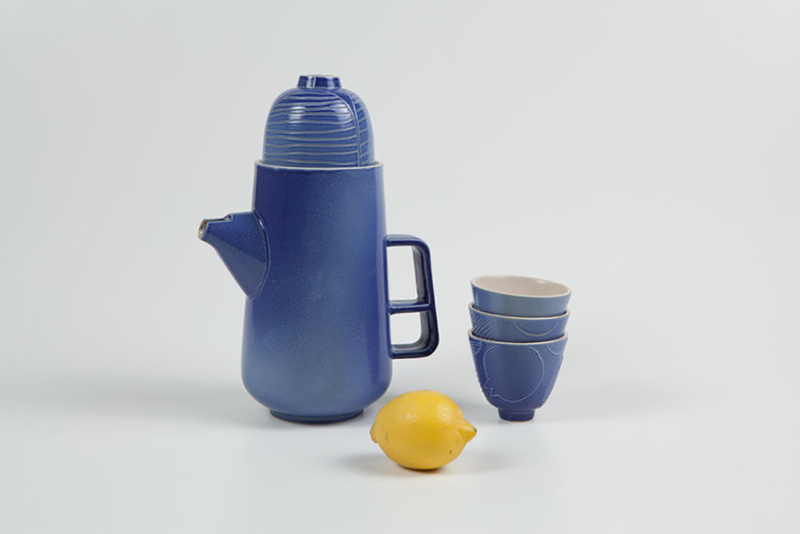 All along the Silk Road – from China to Arabia – this pottery with the bright light blue glaze called ishkor was in the greatest demand.. ‘Although the work nowadays is rich in diversity of shapes and patterns, the masters must pay tribute to tradition,’ says Daria. 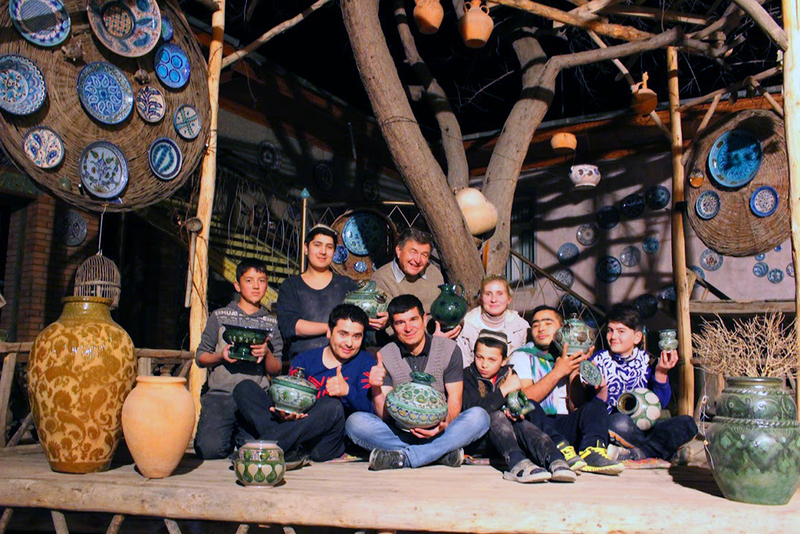 On this theme she managed to sparkle lively discussions with Alisher Nazirov, one of Uzbekistan’s most famous ceramists. Which in itself is already remarkable, since this is a men’s domain in this rather conservative Central Asian country. In the end the outcome was the Communication Teapot. 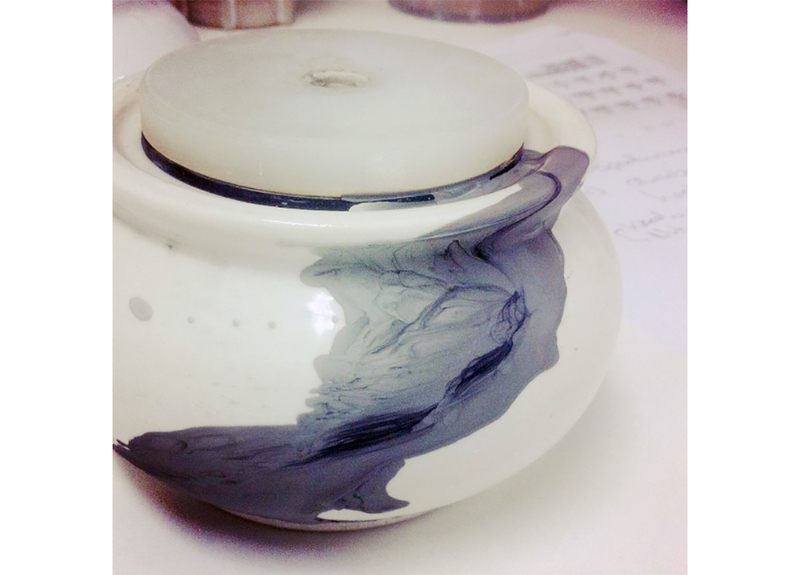 Daria also did research on alternatives to create certain glaze colours, since the plant that the Uzbek ceramists burn as a base is almost extinct. She got some promising results from experiments with nut shells as an alternative. 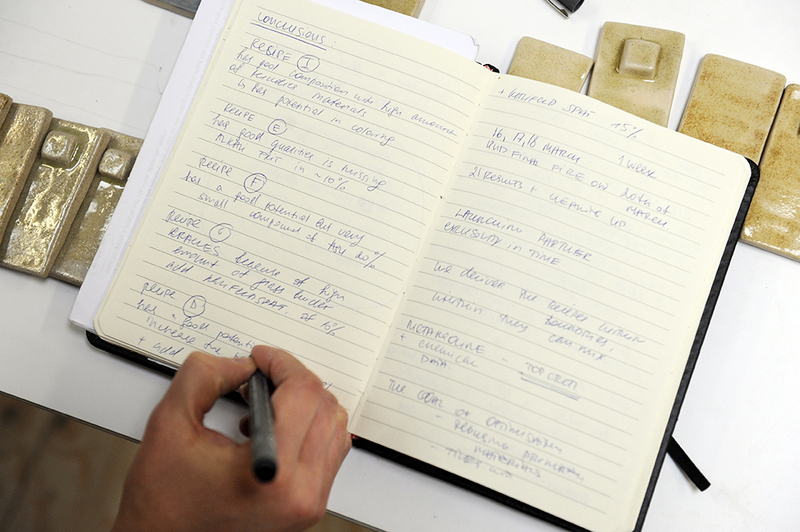 ‘For them sustainability is a relatively new concept. I hope they will pick up some ideas from this research,’ says Daria. In Eindhoven Daria also did an additional internship at Yksi, a design office that also runs an exhibition space and shop. After her graduation in Vienna she returned to this Dutch city. For personal reasons – she fell in love with an Italian boy who was doing a PhD at Eindhoven University of Technology and found a job near Eindhoven. 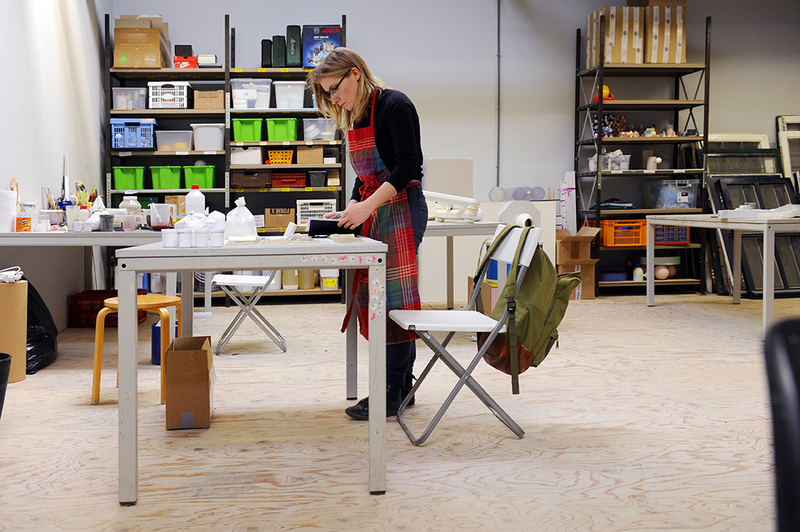 But also for professional reasons – she likes the design atmosphere in Eindhoven very much. She has started her own studio based at Yksi Expo. Designers from different background and with different expertise have their workplaces together in the same space, which leads to interesting and innovative crossovers. 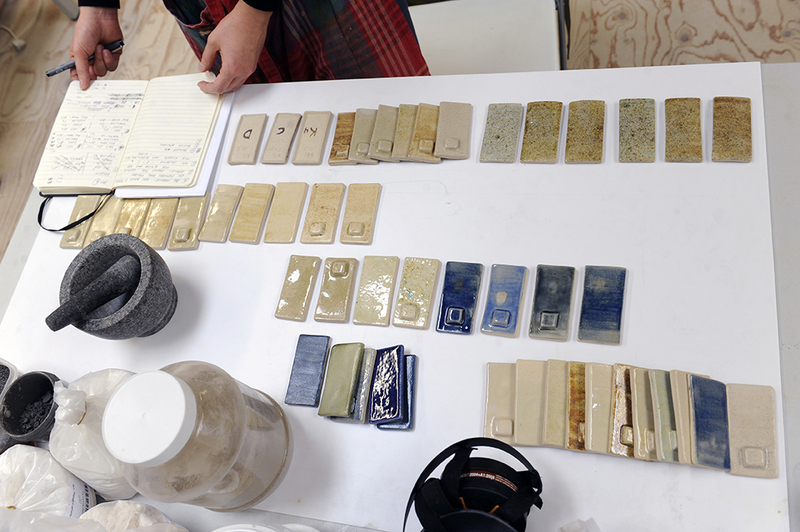 Next to different design jobs Daria is continuing her research in the field of ceramics. 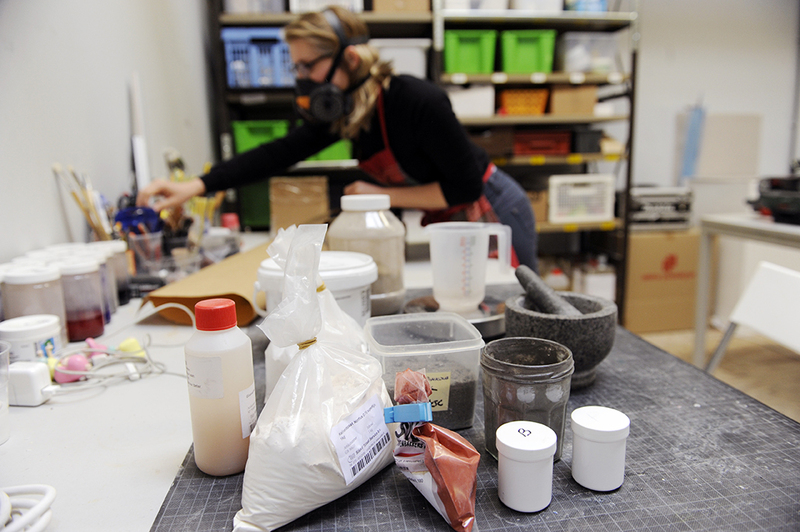 For her experiments she makes use of the facilities of Fabrique Ceramique, a well-equipped workshop near the centre of Eindhoven. In the fall of 2016 she was invited for a stay as designer-in-residence at the well-known Vista Alegre Atlantis company in Portugal. 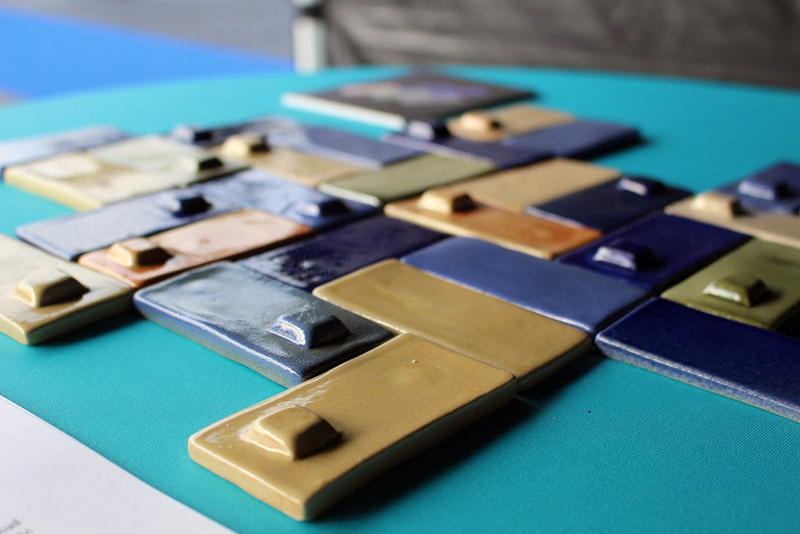 And in the Netherlands she has developed, together with Mineralz (formerly Van Gansewinkel Minerals) a method to use mineral residues from bottom ash from incinerators in the glaze of tiles, which resulted in a patent procedure. 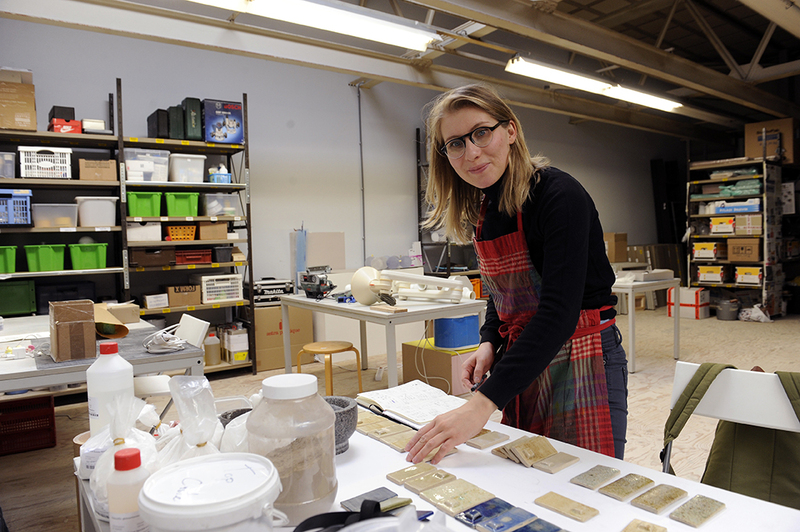 ‘It could be a contribution to a more sustainable tile production process,’ says Daria. 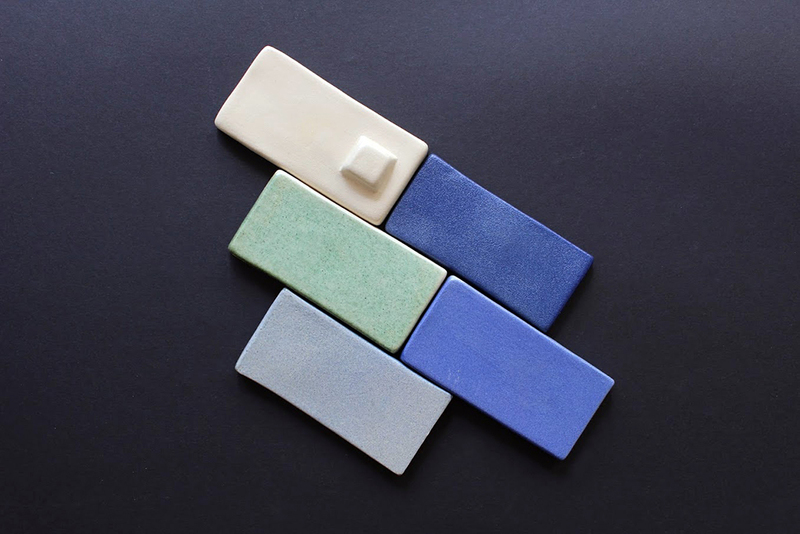 Her finding, named ForzGlaze, has been nominated for the New Material Award 2018.